This survey was headed by Rebecca Ivanoff in 2008. The survey area for this project included Awenda Provincial Park and the greater park ecosystem of the Penetanguishene Peninsula. The Penetanguishene Peninsula is located at the southeastern end of Georgian Bay, and is comprised of the northern portion of Tiny Township. For the purposes of this report the Peninsula is defined as that land north of Balm Beach Road (Concession #10) not including lands administered by either the Town of Midland or Penetanguishene. Giant’s Tomb Island was included in the survey area, excluding Hope, Beckwith, and Christian Island. Awenda Provincial Park is situated at the northern tip of the Peninsula, northwest of the Town of Pentanguishene. The Park is made up of 1,943 hectares (ha) of land on the Peninsula and 199ha of near shore water. Awenda also includes 462ha of Giant’s Tomb Island and 393 ha of surrounding water. The total Park area is 2,997 ha (7,406 acres) (OMNR, 1990). 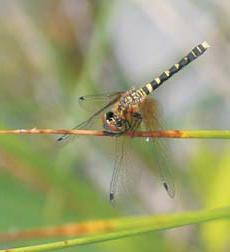 A survey of dragonflies and damselflies (odonata) was sponsored by the OMNR Species at Risk Stewardship Fund during the fall of 2007 and the entire field season in the spring-summer of 2008. The survey concentrated on 6 identified Odonate species of management concern known to occur within Awenda Provincial Park and a suite of 15 additional rare species and sub-species that have been documented within a 25 km radius. The Penetanguishene Peninsula was investigated for a 22nd species, Hine’s Emerald (Somatochlora hineane), which was discovered in Minesing Swamp in 2007. 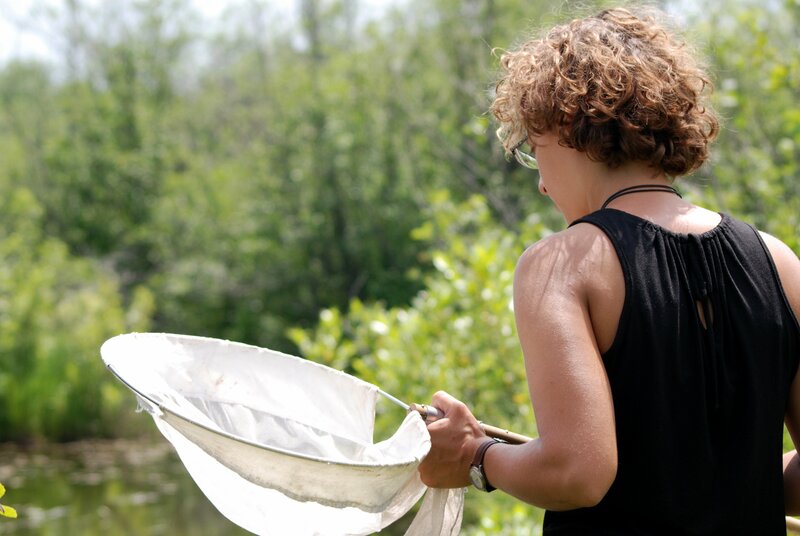 The primary goal of the survey was to collect element occurrence data (or species records) for all encountered species of Odonata on both private and public lands on the Penetanguishene Peninsula, including Awenda Provincial Park. Data will be used to track species of management concern and allow for comparisons with future data collection for an important group of indicator species. 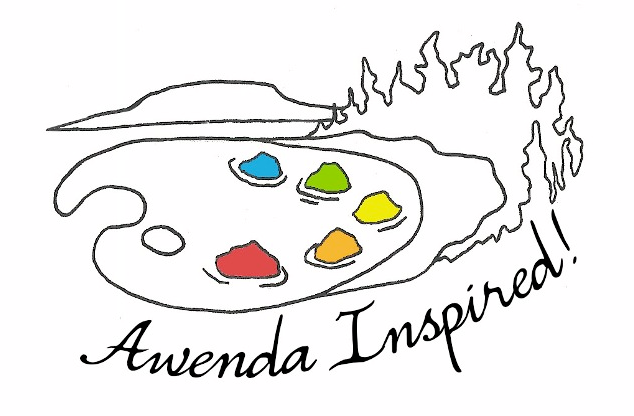 It is hoped that the information collected will be utilized in management planning within Awenda Provincial Park and the greater Park ecosystem and serve to engage the local community in wetland stewardship and species at risk conservation. The project was organized through the Friends of Awenda Park, with funds coming from the Ministry of Natural Resources Species At Risk Stewardship Fund with matching and in-kind donations from both the Friends of Awenda Park and Ontario Parks. Recent post-secondary graduate, Rebecca Ivanoff, conducted the survey. Five field days were conducted with consulting biologist, Robert L. Bowles. Tim Tully, Natural Heritage Education Leader at Awenda, provided invaluable guidance and input during the inventory and reporting phases of the project. Burke Korol, Ontario Parks’ Zone Ecologist and Colin Jones, Odonata expert at the Natural Heritage Information Centre, both were available for questions throughout the project. The Odonata survey was conducted within the Penetanguishene Peninsula. Field days were conducted twice weekly from the end of May until the beginning of October 2008. This equaled approximately 8 hours on 36 days, totaling 288 hours. All records were submitted to the OMNR’s Natural Heritage Education Centre in Peterborough. Final reports were sent to the Species at Risk Stewardship Program, the Natural Heritage Information Centre, and Awenda Provincial Park. 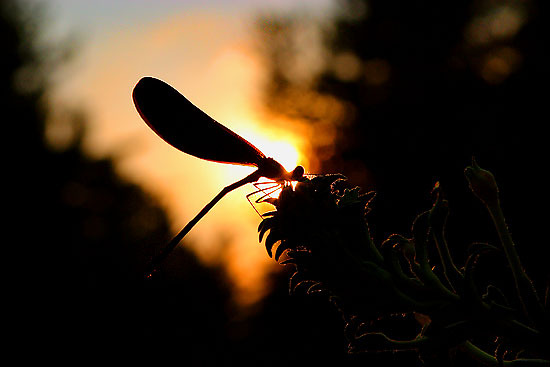 Over the 2008 summer, thousands of Odonate specimens, belonging to 9 families and 56 species, were observed on the Penetanguishene Peninsula. 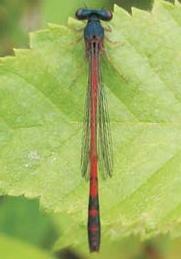 Of the 56 species, 20 were from the suborder Zygoptera (damselflies) and 42 from the suborder Anisoptera (dragonflies). However, the most striking discovery of the study was the concentration of two of the S3 species. During late June and early July, individuals of Eastern Red Damsel (Amphiagrion saucium) and Elfin Skimmer (Nannothemis bella) were observed on Awenda Park’s sand beaches and the coastal meadow marsh. After observing Eastern Red Damsel (Amphiagrion saucium) and Elfin Skimmer (Nannothemis bella), Robert L. Bowles wrote “this shows how important these special habitats within Awenda Provincial Park are when you find such an abundance of two S3 species” (pers. comm. 2008). It was estimated that approximately 2,000 individuals were observed around six seeps along the Georgian Bay shoreline. Robert L. Bowles had never in 20 years of Odonata surveying throughout Simcoe County seen species of management concern in such abundance. In an attempt to concentrate on the Odonata species of management concern known to occur on the Penetanguishene Peninsula, a few field days focused on suitable habitat for Somatochlora and Gophidae. On June 21, 2008 Robert L. Bowles and Rebecca Ivanoff performed a complete check of the seeps along the cobble shorelines below the old Nipissing Bluff, with the focus on finding Somatochlora and particularly S. hineane. ‘Sadly, we found no Somatochloras flying in these areas or anywhere else during the day’ (Bowles, pers. com. 2008). Wetland habitat within the Park accounted for significantly greater biodiversity compared with surveyed wetlands outside the Park. Twenty-two (22) of the 62 species (or 16 of 56 species seen in 2008) were not documented beyond the park boundary despite the fact that private lands were surveyed at similar times. Further study is necessary to determine the relative importance of Awenda habitat and why or if the diversity and distribution of Odonata species in the larger Peninsula is truly greater within the Park. Regardless, it can be said that the wetlands of Awenda, including the kettle lakes, beaver ponds, coastal meadow marsh, and sand and cobblestone beaches, are of importance to Odonata diversity on the Penetanguishene Peninsula.